Joyful and life affirming is how I’d describe the garden at Old Bladbean Stud. Hidden among the labyrinthine lanes of South East Kent, owner Carol Bruce has created a garden of great substance from a site that was utterly derelict as recently as 2003. It’s a rarity these days to come across a new, large garden created by a private individual, and all the more compelling when you discover that Carol has no horticultural training and maintains the whole place single-handed. Having gardeners would be ‘like buying a jigsaw puzzle and then hiring someone to do the puzzle for me” remarks Carol in the garden’s new guide book. Old Bladbean Stud is testament to what can be done with a little grit, determination and imagination. I came away feeling genuinely encouraged and at the same time slightly humbled by her achievement. Of course, a garden on this scale (three acres) does not come cheap and Carol is candid about the total cost of her project: about £100,000. However when one reflects on what this might equate to in property or even cars, it’s lot of bang for your buck. Spread out over ten years, it’s probably less than some people (ahem) spend on clothes in a year. Best leave the comparisons there! A tour of the garden begins in an unprepossessing gravelled yard, where Carol sits in the cool shade of a tree, welcoming visitors. Passing through a brick arch, the experience is how I’d imagine entering Narnia’s summer counterpart. Immediately one is immersed in a maelstrom of scent, movement, texture and colour. 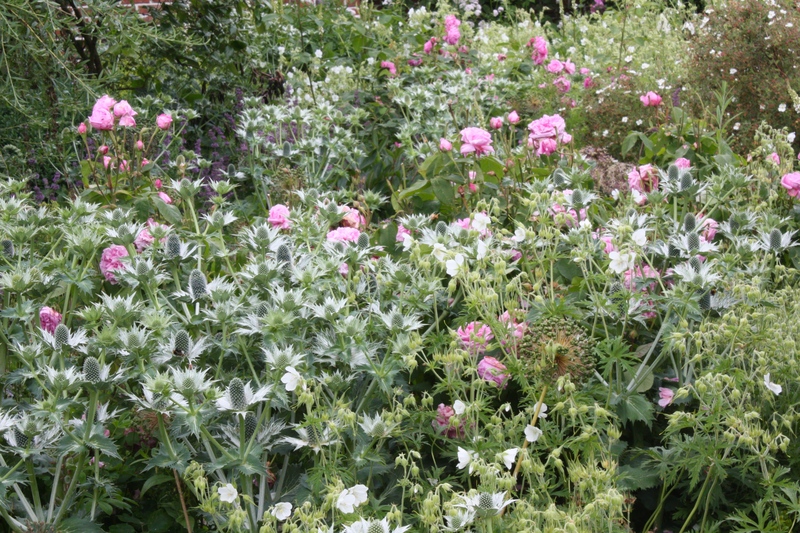 Crowds of spikey allium heads carpet the ground beneath robust, lusciously scented roses; campanulas and delphiniums shoot up like rockets in the spaces between the bushes; and verbascums, eryngiums and geraniums flood any gaps that their compatriots have left. Like Narnia, the scene represents what is for many of us a fantasy, a dream of what an English garden should look and feel like. The plot’s unusual shape calls for some interesting transitions. What could be an awkward, curving lawn, named Lamby’s walk, is afforded a focal point in the form of a life-sized Irish Wolfhound sculpture. 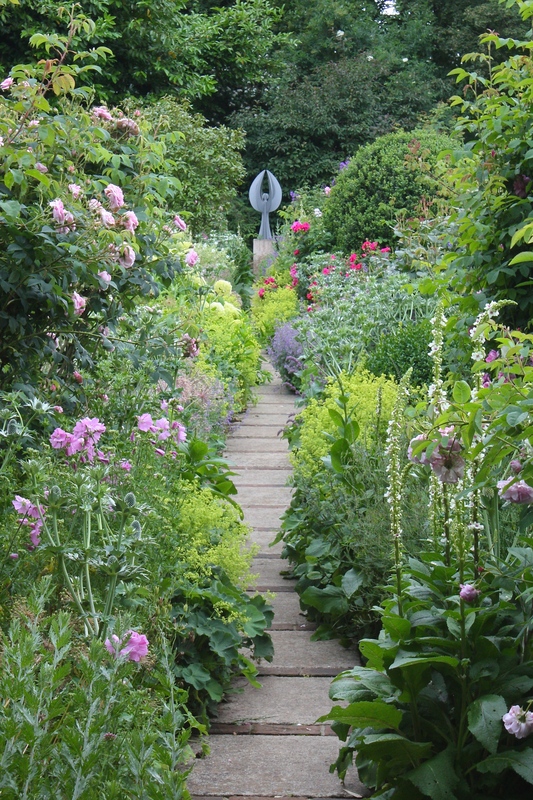 The grassy walk leads visitors from the rose garden to the most ambitious of Old Bladbean Stud’s features, the double mirrored borders. How many people in this day and age have the vision and guts to create parallel herbaceous borders 300ft long by 60ft wide? Not many. The planting is superb, even following a spell this winter when large sections were submerged in water for over six weeks. 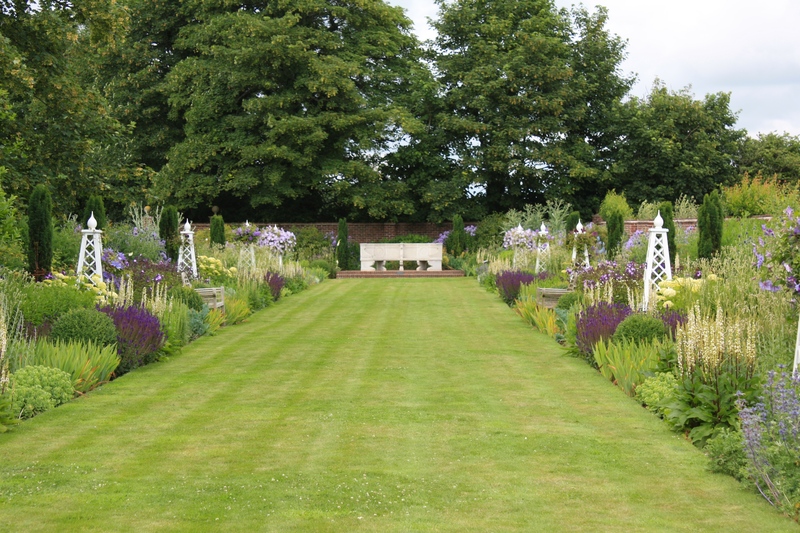 There are two lines of symmetry in the planting, one running down the length of the lawn and the other across the middle, meaning that every plant grouping appears four times. The architecture of the borders is important as it bears little relation to the house or any other anchor point. Handsome stone benches provide a spectacular vantage point at either end of the lawn, whilst obelisks create height, rhythm and accentuate the symmetry of the planting. Carol has chosen flowers which echo the colours of the sky, creating a third line of symmetry. 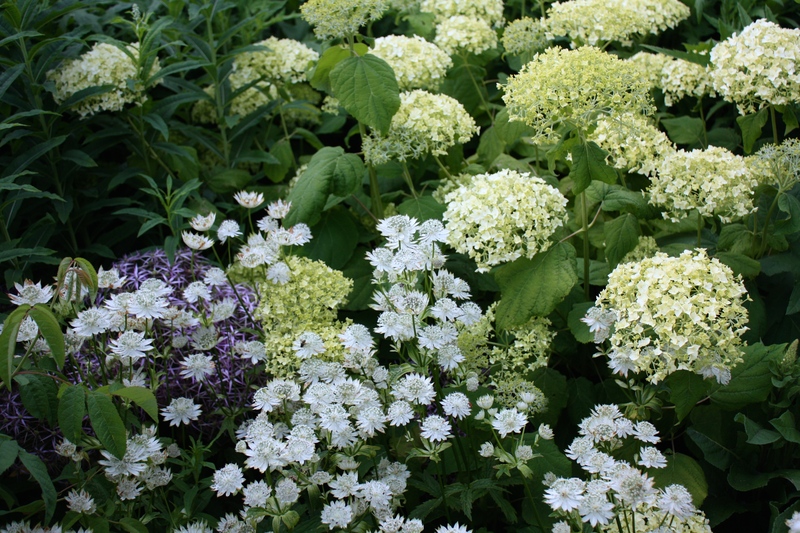 Naturally in borders of such immense scale, planting blocks are substantial and there is room for beasts like Crambe maritima, Campanula lactiflora, Macleya cordata, Cynara cardunculus and Eryngium yuccifolium. 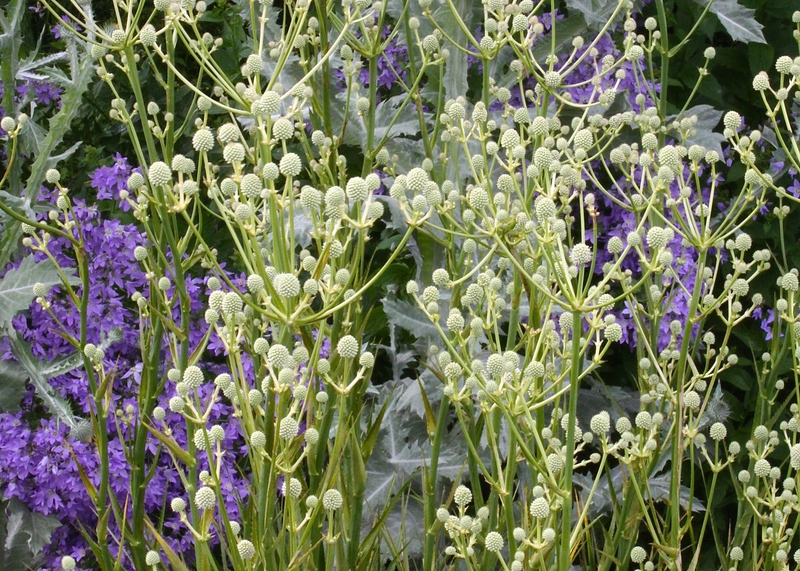 Not denying the frequent greyness of British skies, Carol has made abundant use of silver leaved plants such as Artemesia ludoviciana ‘Silver Queen’. A long gravel path shaded by Magnolia x loebneri ‘Leonard Messel’ guides visitors to the enviable kitchen garden, itself 330ft long. Carol describes it as a ‘crop rotation conveyor belt’ and has positioned taps and compost bins along its length the reduce the amount of plodding up and down required. 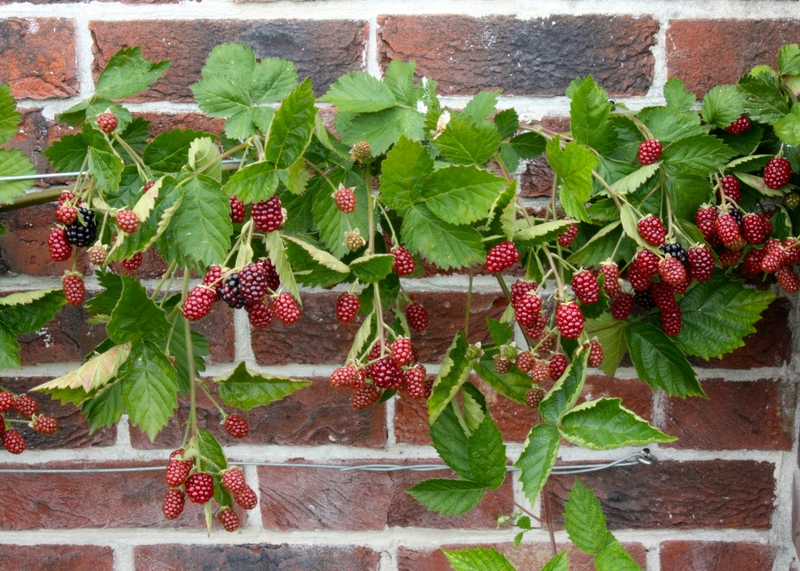 The soft fruit was at its peak this weekend; blackcurrants, redcurrants, raspberries and strawberries all sweet, jewel-like and begging to be harvested. Of course we restrained ourselves, but it was tough! Closer to the house, which unusually has very little relationship with the garden, lies the pastels garden. This enclosed square space is so called because of the way Carol has arranged the pale colours to blur into one another, like an artists pastels. 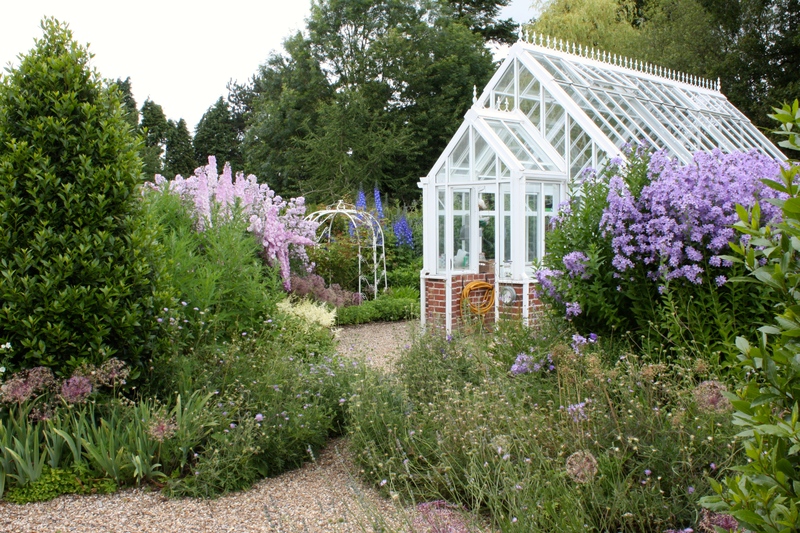 To the left of the photograph below, the cloud of pale pink is composed of Campanula lactiflora (perhaps ‘Loddon Anna’?) and a pale pink delphinium of exactly the same shade. The yellow garden was one of the very first areas Carol tackled, and was intended as a place to sit, eat, read the paper, shell seeds and brush her dog. It now provides a beautiful setting for a refreshing cuppa and is slowly morphing into a tea garden. The rose varieties are predominantly hybrid musks and David Austin hybrids mixed with white flowered albas. Other plants include sissyrinchiums, aquilegias, geraniums and Digitalis lutea. The garden was exuberant when we visited in late June, filled with bloom, alive with bees and heady with scent, but this stud is far from a one trick pony. Carol has planned her planting schemes to provide a long season of interest, extending from April to October. 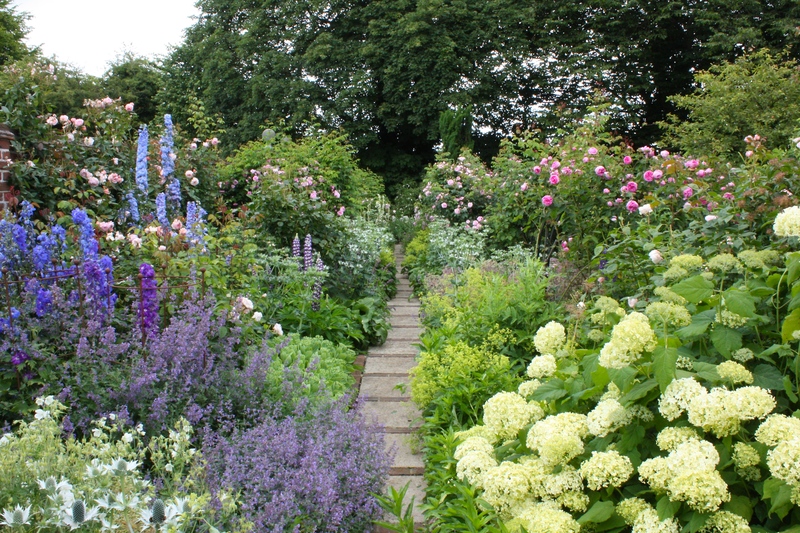 She recommends the peak time for the double mirrored borders and pastels garden is August and September, demanding a return visit. 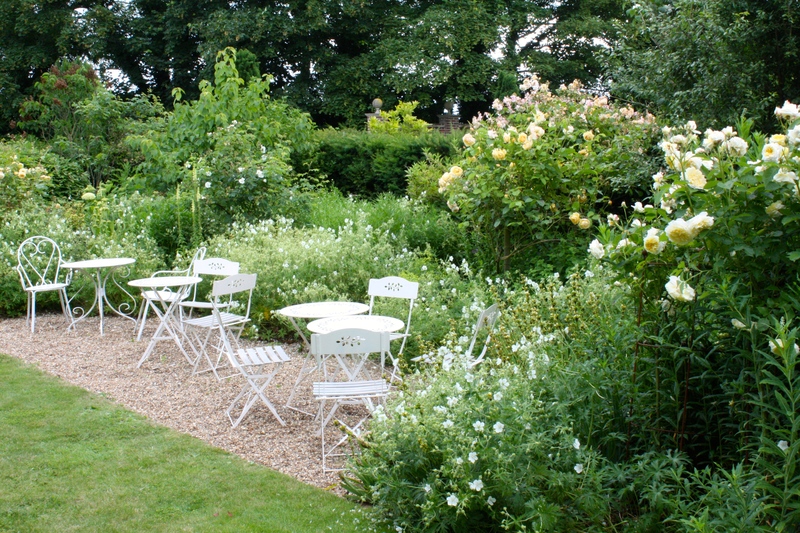 Despite its off-beat location, Old Bladbean Stud is a garden that deserves to be better known. For now, let’s keep it our little secret 😉 Old Bladbean Stud is open for the National Gardens Scheme on 13 and 27 July, 24 August, 7 and 21 Sept and 5 Oct 2014. Admission £5.50. Click here for more details. The damage – extraordinarily only one plant this time, Phuopsis stylosa, the large-styled crossword, which Carol allows to romp around beneath her roses. This is a GARDEN! Wow – I think that angel is shining down so that one woman can create and maintain something that exceptional. Yikes. This is the sort of story I imagined being written about my garden 20 years ago. Realising how far I fall short on plantmanship, impact and expenditure is – to use the same word you used – a humbling experience. Thanks for the tour. I will refer back to Old Bladbean Stud (only in England would you find such a name!) before I next visit the UK! Yes, such an English name. You do yourself a disservice if you think you have not created something amazing yourself. I have been equally awed by your achievements in South Africa and you should be very proud of them. Hope you visit us soon 🙂 Dan. Oh…. My goodness how extraordinary… This is such an inspirational garden. I will be dreaming about this forever…. This is my dream, although I have to temper my enthusiasm given my climatic conditions. This woman deserves a HUGE magnum of bubbles to celebrate such excellence. Stunning. Thx TFG for sharing. H from Oz….